For my portfolio book I chose to create something that illustrated the humanitarian element of the photography that I enjoy doing. I wondered if this area of photography would lend itself to being published in a book and how much of a living I might be able to make this way. Christopher Manson is a photographer that studied in Hull a few years ago and has since moved around the world, taking photos, lecturing and publishing books. I contacted him this week to ask him for some advice about making and self-publishing books. I firstly wondered what made a topic worthy of a book. So I asked how he chooses a topic for a book. Manson said that his project’s don’t initially start out as books, he finds it too restricting and instead allows the work to dictate how it should be presented, possibly through a book, an exhibition, just a web gallery or presumably, a combination of formats. Sorting and sifting photos to decide which ones are included in a book is something that I find really difficult. I take so many photographs and find it a wrench to leave any out of a collection. I asked Manson for advice on how to do this better. He agreed that editing and sequencing is the most difficult part of the photobook making process. He explained that images could be grouped simply – they can be paired together based on objective similarities such as colour tone and composition. Images could also be grouped chronologically just like a film, consisting of a beginning, middle, and end. 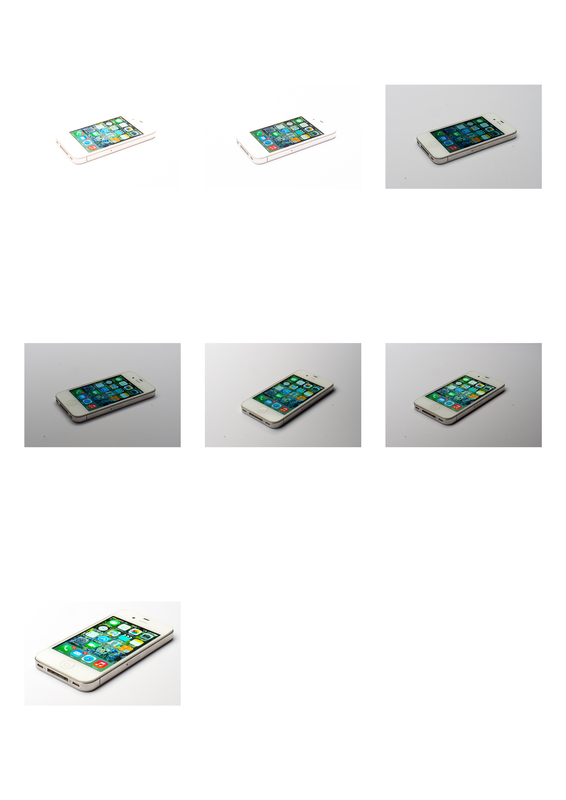 Alternatively, images could be grouped more experimentally and loose, with no real connections at all. He suggested that I may also want to utilize more complicated organizational strategies, such as creating a thematic grouping. This is done by placing images together based on their content (love, war, religion etc.). I look at each image one-by-one and ask myself: “What is the image saying?” It doesn’t have to be anything particularly deep, but it has to communicate something in relation to my project. If my project is about love, then how does a picture of a gun relate to the project? Then, on the reverse of each photo, I list some keywords to remember the content, such as “religion”, “love”, “war”….that sort of thing. After doing this, I should have learned something about the themes embedded in my imagery, and therefore my project as a whole. I could see from the Christopher Manson website that many of his books are self-published. I wondered if this was a deliberate choice. Manson explained that by self-publishing it gives him total control over the look of his books. I have used Blurb in the past and could see that at least one of Manson’s books is published through Blurb so I asked Manson for his opinion on the service. Its all very well making these books but I wondered who would buy them and how they might be promoted to the target audience. And of course I wanted to know if someone could earn a living from making books. I find all this very interesting and it is good to understand that photobooks will not always be the end point of a project or the thing that pays the bills but that it is a useful addition to my portfolio of services. Although the main point of this assignment is to create a book that can be used as a printed portfolio I think it would be useful to have books, showcasing the photographic projects I undertake, that are available for people to purchase and can be used to highlight my best images. I really like the process that Manson uses and will try this for my next project. I think I work best in the evening and often end up writing these posts quite late at night so it will be a challenge to ensure that I am fully awake and alert when I edit and sequence images for a book. Mason also suggested a number of websites and blogs that he has found useful. I have checked them all out and found the following to be particularly useful. Our second photo challenge was to recreate this photograph of a mobile phone. Like the white cup, this two looks easy at first glance but was actually quite tricky. I set up the phone my phone on a sheet of white perspex on a table with the camera directly in front and one single lamp above with a large softbox on it to give soft lighting.I was using my 50mm lens so, considering the depth of field, I positioned the tripod and phone so that I could focus about a third of the way into the phone, keeping the whole phone in focus. I metered the light, checked the histogram and finally decided to set my camera at ISO50 and 3 sec at f20, this would allow the flash to go off and the camera to remain open momentarily in order to capture more light and detail from the phone’s screen. The original picture has a reflection of the softbox going across one corner to illustrate that the screen is reflective. I spent nearly an hour moving the light, up and down, this way and that trying to get that line and just could not manage it. These are a few of my test shots on a contact sheet. This is my final image next to the original. 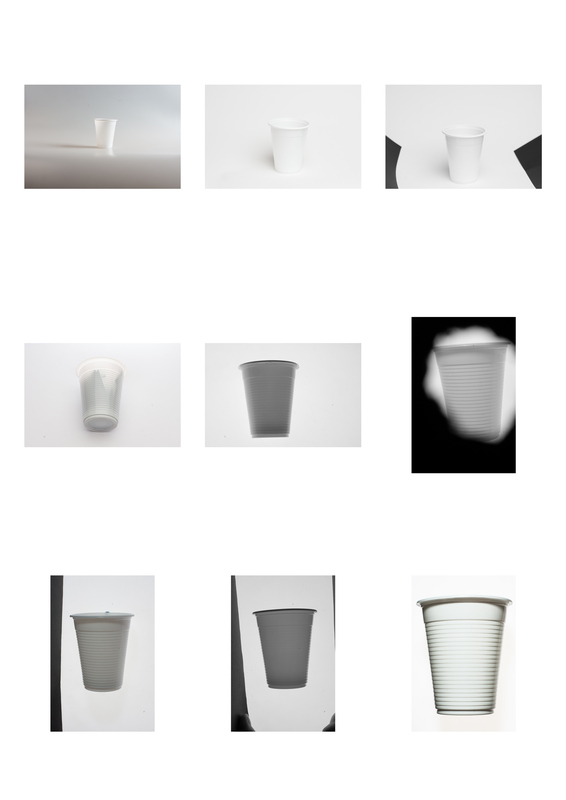 For the first of our photo challenges we were asked to reproduce this image of a white cup. At first glance it looks like the simplest thing to do but it was the worst. I had seen online about how to do black line lighting and went into the studio the first time with a detailed plan and while I wasn’t far wrong in the set up I couldn’t my photos looking anything like the picture above. It was two more attempts in the studio before I got anywhere near close. In the end, I set the studio up as below, with a light table between two tables and a lamp underneath to light the background. I used a second lamp to light the cup from above. I used the histogram on the camera to help me light the background perfectly. Eventually the camera was set to ISO50, f22 and 125th shutter speed. I had tried standing the cup upright, filling it with paper and liquid but still could not get the right effect. Finally I cut the rim from the top of one cup and placed it inside another, then I laid the cup on the table and photographed it from above. I used a small piece of blu-tac to prop up the bottom of the cup and make it level. To create the black lines along the side of the cup I initially used sheets of black card to reflect shadows back onto the cup. I then photographed the cup through a pinhole in a black card but this didn’t work either. Eventually, with the help of Anete we found that black card, folded and curved under slightly imitating the curve of the cup worked best and gave the best black line. We managed to get it almost right on one side of the cup but couldn’t get it quite right on the other. This is a contact sheet of some of the white cup photos. Here is the final image next to the original. Optimising the website so that it can be found easily by websites feels really complicated but it has been made easier by the Moonfruit software I have used. First, I checked through the whole website and made sure that all the links were working. Broken links can cause search engines to hit a dead end and stop searching. then I typed a few search phrases into Google and noted the page titles and descriptions of the websites at the top of the results. I used these as inspiration for my own page titles and descriptions. Page Description: Henden are among the top wedding photographers within Lincolnshire. Covering nationwide. Wedding photography in Scunthorpe, Doncaster, Hull, Grimsby. Page Description: Are you looking for a wedding photographers in Lincoln, Scunthorpe? Great prices on wedding photography and event photography. Call 01724 764 134. For each of the page titles I described the page, included keywords and my website name as this is used by every search engine listing. 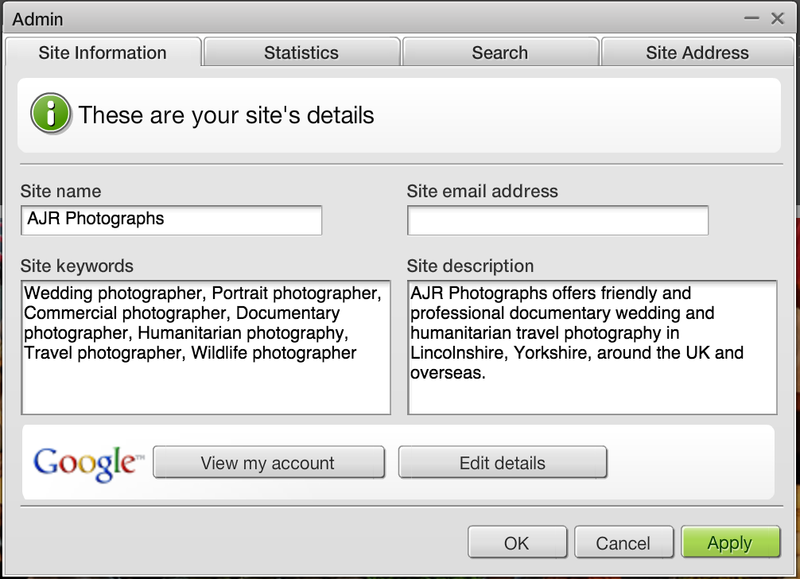 As well as appearing in search engine listings the page title also appears at the top of the browser window. The optimum page title length being between 65 and 75 characters. On the home page I have used the following title: Wedding, portrait, documentary and travel photography by AJR Photographs. The page description doesn’t really have an impact on search engine listings but if i say the right thing in it, it may inspire someone to click on my link as they look through the listing. Between 150 and 160 characters is ideal for the page description. In the home page I have used the following page description: AJR Photographs offers friendly and professional documentary wedding and humanitarian travel photography in Lincolnshire, Yorkshire, around the UK and overseas. I can set these for each page and I can also set these for the site as a whole. I understand that keywords are used less by the search engines these days but there is still an option to include some that are relevant to my site. Keywords are also useful if I choose to do some online advertising. Using two or three-word phrases improves your chances of ranking highly as these phrases attract fewer competing companies and sites, and can be more specific to your market. The goal is to find keywords and terms relevant to what I offer, that have a high search volume and low competition. To help me choose the best keywords, I logged into Google Adwords and chose Tools / Keyword Planner and then Search for new keyword and ad group ideas. Going to the ‘Keyword Ideas’ tab there was a list of relevant keywords and phrases that people have been searching for on Google along with information about how many people had searched for each phrase and what kind of competition there is from other businesses. I used this information to help me create unique names as well as descriptions and keywords for each of the pages across the site. I will be able to monitor and track the success of this using Google Analytics and Google Webmaster Tools which are all free pieces of software. To monitor the number of people looking at my website I have linked it to Google Analytics. This is free software that will enable me to track visitor numbers, popular pages, and where my viewers are accessing the site. I already have a Google account and a Google Analytics account so I simply logged in and chose the ‘create new account’ option. Once I had filled in the form with the details of my website I clicked “Get Tracking ID’ and was given a unique tracking ID and some code. I copied this to my clipboard and went back into my webpage. I opened up services and chose the setup Google Analytics option before pasting the code into the box that appeared. All that was left was to click Save and I was done. The Google Analytics YouTube channel has some great explanatory videos about how to get the most out of Google Analytics. This is a particularly useful introductory video.